As at the time of filing this report, 7:50pm, Atiku's team of lawyers led by Mr. Chukwuma Machukwu Ume, SAN, Chief Mike Ozekhome, SAN, and Mr. Emeka Etiaba, SAN, are perfecting the filing process at the Central Registry of the Presidential Election Petition Tribunal, PEPT. "We asked that our candidate who won the election massively across the country be declared the winner. "In the alternative, we also asked that the election be set aside on the ground of irregularity which was apparent across the country. "We have a pool of 20 SANs who are tested in election petition matters and other senior lawyers who are also working with them. So we are confident. "We have also lined up more than 400 witnesses that are going to testify in this petition. "Nigerians are at home with what happened on February 23, the sham they called election. We are going to re-present those facts to Nigerians, we are not going to manufacture facts", he added. Justice Abdul Aboki who delivered the lead ruling of the tribunal, held that Atiku's request for experts to be permitted to conduct forensic audit on the materials, could not be regarded as "inspection" that was allowed in section 151 of the Electoral Act. 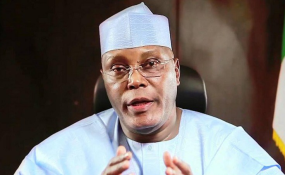 He said he would need some of the electoral materials currently in INEC's custody, to be able to prove that he legitimately secured the highest number of valid votes ahead of Atiku who came second at the election. "I am of the view that the prayers sought, ought to be granted", Justice Aboki held, stressing that the Applicants or their representatives should be granted access to the polling documents. "The 1st Respondent (INEC) is hereby ordered to forthwith, allow the Applicant or his representatives to inspect all the polling documents used in the just concluded presidential election to allow the Applicant to defend any petition that may arise from his declaration as winner of the February 23 presidential election", the tribunal held.